If you’ve been using Facebook for any period of time you too have probably seen your share of “odd” posts. Some are funny, some are silly and some are even bizarre but this is the first time I’ve heard of anything like this. 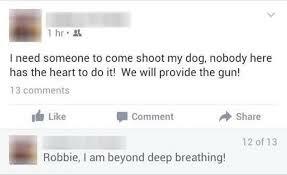 Recently, a woman in Smith County, Texas asked if anyone on Facebook would be willing to shoot her dog. Her exact quote was simply, “I need someone to come shoot my dog. No one here has the heart to do it. We will provide the gun”. Her reason for such a bizarre request? She informed local animal control officers (who quickly showed up at her home) that she could no longer care for the dog and it kept getting into the garbage. Cinnamon, her 3 year old Saint Bernard / Bulldog has been removed from the home and placed with a foster family until a permanent home can be found. She has been examined by a veterinarian and given all of the necessary vaccinations required for her age. Smith County animal shelter director Nanette Moss stated that "It's devastating. I work with these dogs every day. They are my life, and when she walked through my door it just broke my heart. She's a sweet dog and how can somebody shoot a sweet dog?" In case you are wondering, it is in fact illegal to post this type of request on social media but considering the fact that the woman voluntarily handed her dog over to the proper authorities before she was charged with a crime no future legal actions against her are expected. So how does her son feel about the entire incident? Well, when a local news crew turned up at their door to question the woman about the incident they were greeted by her son. His exact words were, and I quote, “I know how the media works. You people are the f-----g devil”. Somehow, considering the actions of the mother, this doesn’t surprise me in the least.